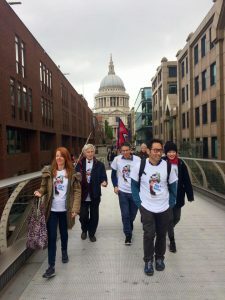 On Saturday, 16 September we took part in the ‘Walk For Nepal’, alongside around 70 other volunteers from three other NGO’s doing incredibly important work in Nepal. We banded together, our Mondo team, to fundraise for the valuable work we do supporting girls education projects and to show solidarity with all the incredible work done by Bridges Nepal, Child Rescue Nepal, Many Ogilvy Hands and International Needs UK. The day kick-started early at London Bridge station, whilst we waited eagerly for the team to assemble. Dogs and toddlers in ‘Walk For Nepal’ T-shirts lifted everyone’s spirits as we all hoped the rain would hold off. After a few cups of tea and coffee, many photographs and (most importantly!) 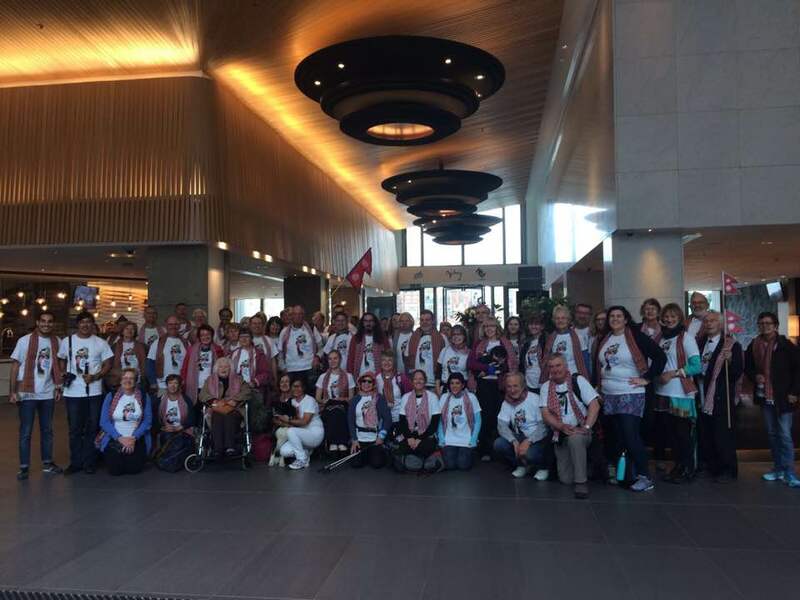 once we were all styling our fantastic T-shirts, we were off! After an hour (or two!) of walking through the busy streets of London, passing over London Bridge, pass the Globe Theatre and Tate Modern. As we approached St Paul’s Cathedral, over the Millennium Bridge, we stumbled across the Salvation Army orchestra (who, after some good hearted heckling, performed a sensational rendition of Amazing Grace!). By the time we arrived at Ogilvy’s offices for a pit stop (albeit a little delayed! ), we were all in exceedingly high spirits! During the break we were able to hear all about the fantastic work our partners are up to in Nepal. 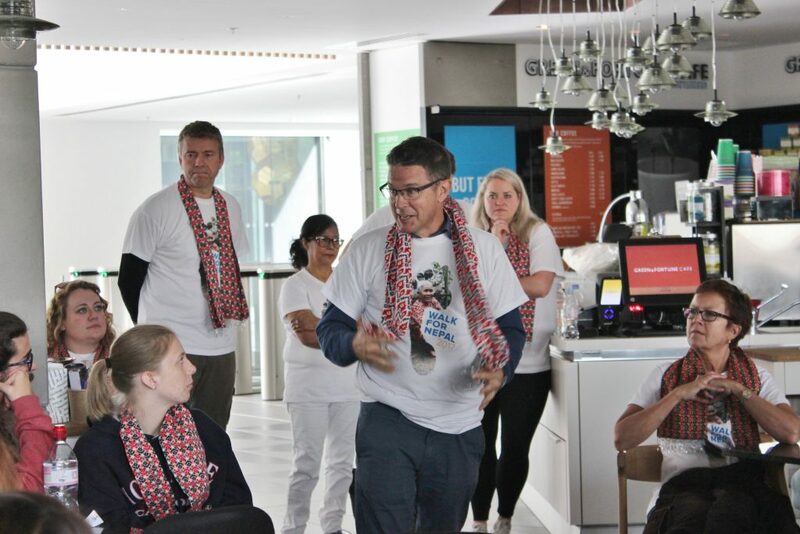 After a welcome introduction from a representative of Many Ogilvy Hands and the National Director of International Needs, Danny Morris, we heard from Jo Bega, CEO of Child Rescue Nepal. She spoke of the 700 children they had saved so far from a life of labour, slavery and addiction. Just recently Child Rescue Nepal rescued 7 boys from working in a factory against their will. We then heard from Sally Singh, who has recently set up Bridges Nepal, an NGO seeking to improve the lives of local people through community development projects. A new NGO with lots of potential and we can’t wait to see what’s next! Next, our very own Stephen Carrick-Davies, the new CEO of Mondo was given the opportunity to explain our projects and how they came about. He spoke of how we became involved in Nepal in the first place, through Anthony visiting his son on a teaching placement, and realising that something had to be done to improve the lives of people in Nepal. He recognised the potential of Jimmy, now our country manager, and we’ve been working in Nepal ever since! Over the last few years we’ve been involved in building over 30 schools with 3 more due to be completed next year. We have also been building girls’ hostels to ensure safe accommodation, close to the schools, so the girls don’t have to walk for hours to and from school where they are at risk of being trafficked. Our current project (what we were “getting our walk on” for!) is to support one of our hostels, Timbu hostel, with running costs; we want to hire a hostel manager to support the girls and buy basic furniture for the hostel. We want to support young women and girls to strive forward for gender equality in their communities by obtaining equal access to education and a place of safety. And we need you help to stride, one step at a time, towards that goal! Click here to find out more about our project and click here if you’d like to donate! You can see what we are raising funds for in the video below! Last but certainly not least, our special guest Esther Napa, the Executive Director of International Needs Nepal, had flown over from Nepal to explain the extensive work they are doing to empower women and girls through the Lydia Project, assisting families through livelihood projects and helping children to access education. 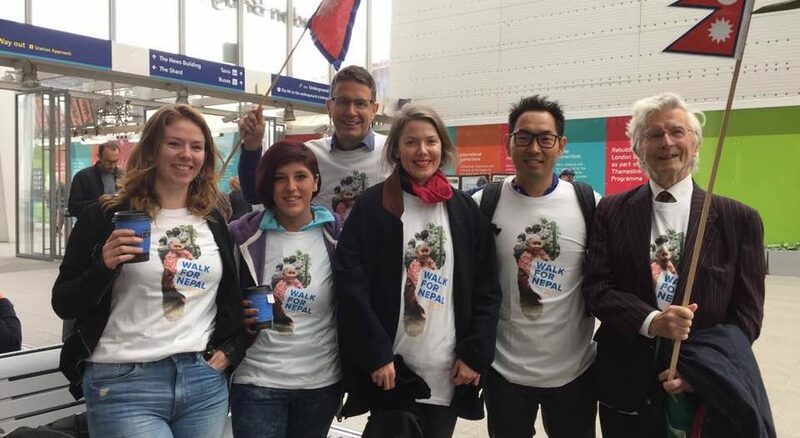 Esther spoke of how thankful she is for the solidarity and support we had shown taking part in the walk and told us, first-hand, how important all the work we do is to the people of Nepal. After hearing all about what everyone is up to, exploring how we could all collaborate (and the all-important photo op!) we set back off again on the walk! We snaked through London crossing bridges like stealthy red pandas (common to Nepal I hear!) eventually stopping for our well-earned lunch break next to Victoria Embankment. Up to this point we had been so lucky with the weather, however the heavens opened and we had to retreat under cover with our slightly soggy Paninis. However, this allowed for some more great chats between groups and some good ol’fashioned bonding over cups of tea. Eventually the rain subsided and the sun beamed back over London. We embarked on the last stretch, back over 5 bridges to finish where we started! We were so happy to be a part of the walk this year and we can’t wait for next year! We want to thank everyone who was involved in organising the event (a particularly big thank you to Sarah from ineeds UK!) and to all our partners who took part. We had such a great day and we are so thrilled to have met so many interesting people! We’re looking forward to collaborating in the future and wish you all the best with future projects! Scholarships in Nepal – introducing our 2017 scholars!